Download a PDF of this infographic by clicking HERE. 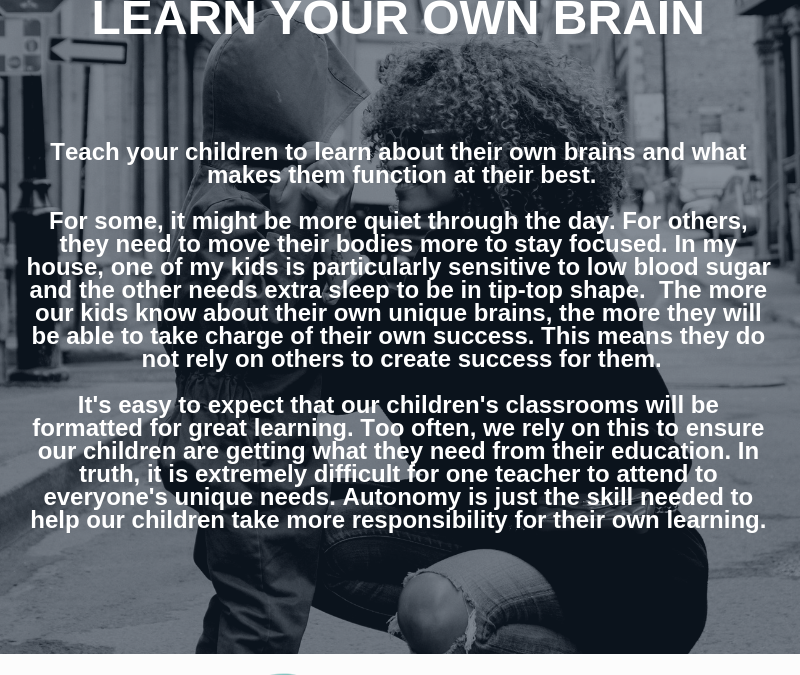 This week, teach your children to learn about their own brains and what makes them function at their best. For some, it might be more quiet through the day. For others, they need to move their bodies more to stay focused. In my house, one of my kids is particularly sensitive to low blood sugar and the other needs extra sleep to be in tip-top shape. The more our kids know about their own unique brains, the more they will be able to take charge of their own success. This means they do not rely on others to create success for them. It’s easy to expect that our children’s classrooms will be formatted for great learning. Too often, we rely on this to ensure our children are getting what they need from their education. In truth, it is extremely difficult for one teacher to attend to everyone’s unique needs. Autonomy is just the skill needed to help our children take more responsibility for their own learning.